2:01. 'Morning, Wolf and everyone! Hope you find a little sunshine in your day. DotCom! Hope you get all of your wishes! Now I'm off to watercolor class. I'm finishing up painting a Great Blue Heron today. We do indeed have a ''wintery mix'' today. Yucky freezing rain/sleet. I've never understood the difference, but, apparently, there is one. Everybody!! Still heavy smoke today. Was at medical clinic yesterday. Many folks with symptoms like a bad cold. Actually caused by smoke! I kept a box of tissues and a trash bucket next to my bed last night. Yuk!! Oh yeah! Now have tissues and bucket next to me at the computer. Off to the city again for a couple of days. When you say city, Keith, what city does that mean? Have fun on your travels! Morning all,easy 1-9 puzzle today. 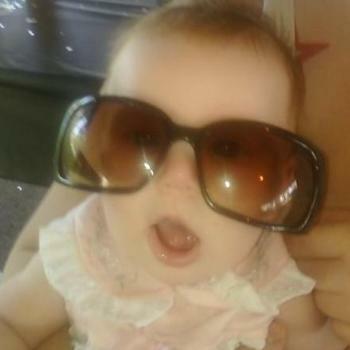 Big sunnies for a little one,cute. Don't know where the s came from, maybe the computer thinks we have more than one. A CP for CP haven't had one for a while. Cute little baby with very large sunglasses. Be careful where you put your feet, Denny. Don't kick that bucket whatever you do. Two infants in one day. Wonder what's on the Parent's Page - a landscape? Guessed wrong. Parent's puzzle has three kids, now no longer kids according to Anne, and water, not landscape. I'll have a Guinness today thanks barman.......Oh, and one for yourself!